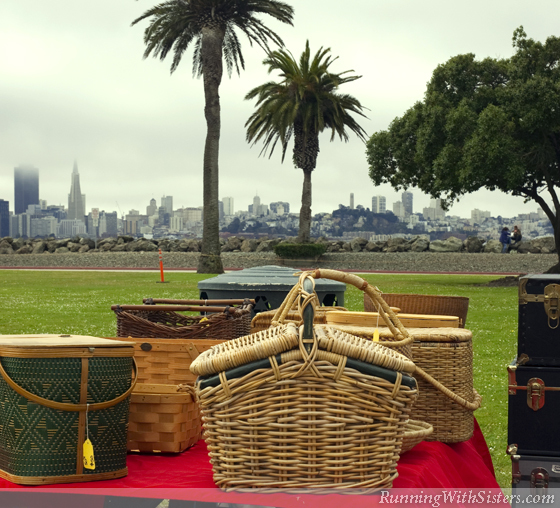 During the summer, San Francisco’s Treasure Island Flea always tops our list of things to do. We think getting outside and shopping by the bay is the perfect way to spend a Sunday afternoon. That summer feeling was definitely in the air when we arrived. The fog had burned off, and shoppers, dogs, and kids on their bicycles were all enjoying the park. The vendors had summer on their minds too, and everywhere we looked there were goodies just right for a sunny afternoon outing. We saw wide-brimmed hats, paper parasols, and even a unicycle. 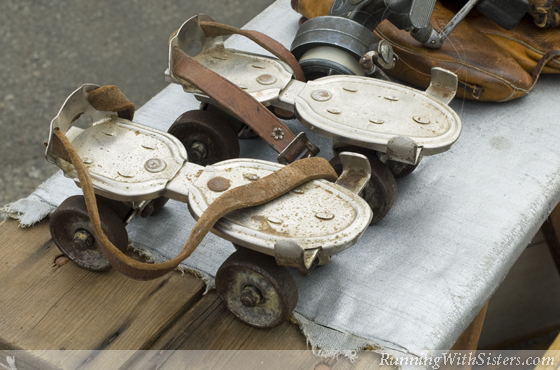 A pair of metal, clamp-on roller skates caught Kitty’s eye. She played with the idea of setting them on a bookcase perhaps with her German toy mice as passengers, but the $35 price tag was too high. So we each got a roller skate key, instead. Two for $5! What day in the park couldn’t use a good picnic basket? 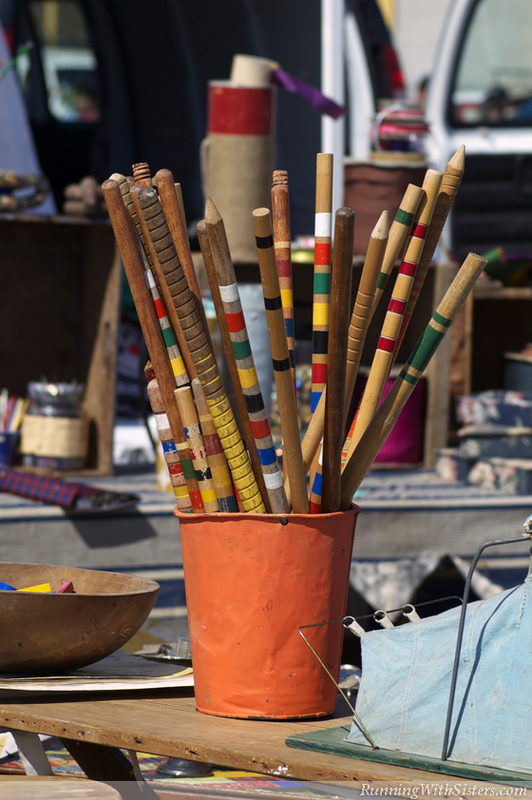 A seller near the entrance had a table of them made of rattan, straw, and leather. We chatted with her about how charming the baskets are, both as decorator accents and as cute caddies for craft projects. Jennifer asked about a green one with an intricate woven pattern on the sides. The dealer told us it was a “Hawkeye Green Weave Basket” by the Burlington Basket Company. We would have bought it for $25, but it was marked $50, so we kept looking. We picked out one with double flaps on top for $20 and tossed in a classic red and white blanket for $12. We took a break and hit the gourmet food trucks to load up our picnic basket. Then we found a patch of grass and spread out our new blanket! After lunch, we headed back where we left off and immediately spotted a dealer with loads of lawn games. 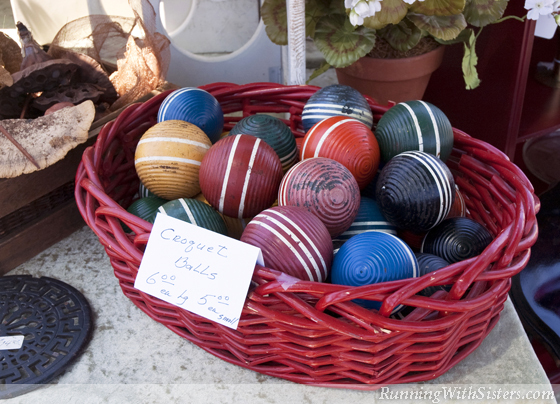 He had tennis and badminton rackets, croquet mallets and balls, and something called Quoits that looked like a ring toss game. Kitty spied an old shuttlecock with real feathers for $7. She was about to buy it when Jennifer held up an awesome game of horseshoes. It wasn’t mint, but it was complete in its original box, which was clearly from the 60s. She said it’d be fun to get it for the whole family to play at our BBQ next weekend. The vendor gave us a deal, only $30 for both! 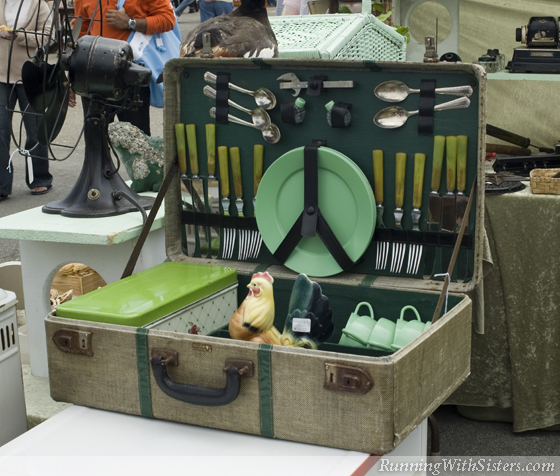 We see picnic suitcases stocked with plates and flatware at the flea market all the time. It turns out these kits were all the rage in the early 1900s when folks took their automobiles out for a Sunday drive. Everything you’d need to set the table for a picnic was packed in a suitcase that fit in the trunk of the car. 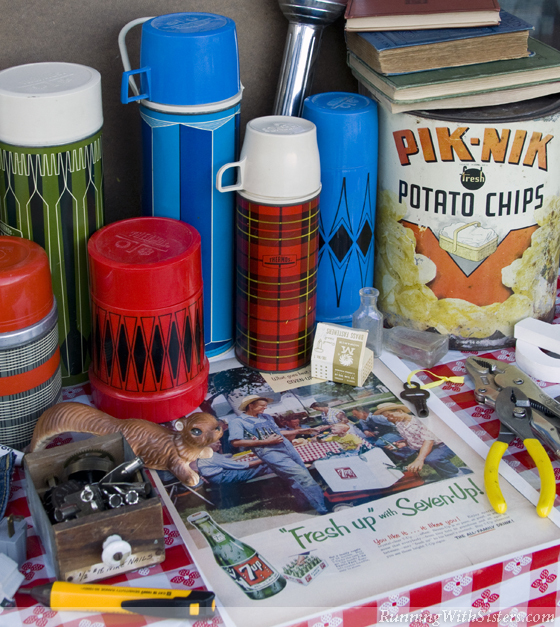 Vintage picnic kits were so closely associated with “auto touring” that they are sold now as “automobilia.” We once saw an antique set from England (with silver and china!) for hundreds of dollars. We’d like to be invited to that picnic!